With a large wellness center, Child Watch, Group Exercise classes and our Schools Out Program the Arcadia Branch is the place to be. We have a wide variety of programs for teens, adults and seniors. Tours are available during regular branch hours. Stop in or call the Arcadia branch for joining information. Call us at 401.539.2306. We have a wonderful community of people here at the Arcadia Branch! It’s a positive, supportive environment where you and your family can feel comfortable while pursuing the activities that interest you the most. When you join the Y, you become part of a family of members who support the Y’s philosophy of healthy lifestyles, mutual respect, community spirit, youth leadership and character development. Our staff is dedicated to providing the best in member service. Almost 2,000 people from several different local communities belong to the Arcadia Branch, creating a diverse and energetic environment we think you will really enjoy! Not a Member yet? 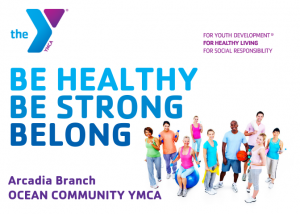 Looking to use the Y facilities for just one day? Stop by the Welcome Center and purchase a one day visitors pass to use our facilities. Must show a valid photo ID, and sign a guest waiver. Children under 18 must have an adult present to sign the waiver. Children 12 and under must have a guardian (18+) with them in the Y.